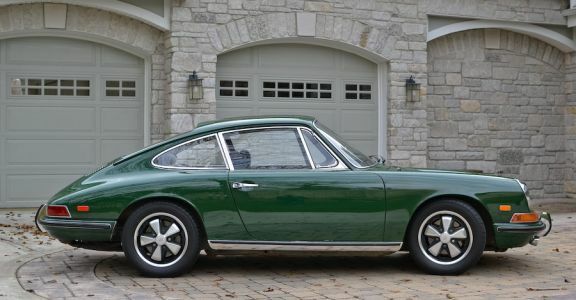 1968 Porsche 911L Original Paint!! 100% original and un-restored Porsche 911. True collectors find with all original paint, except the right front fender which was painted in 1974! Beautiful Irish green over black leather(!) interior. This very collectable swb 911 comes with full and extensive documentation from new. Not quite 78k original miles on the car and only about 2500 on a complete rebuild. Engine has perfect compression with 1% leak down and is absolutely dry! Last owner bought the car in 1974!! The car runs and drives perfect very nice and is a joy to drive. The body has its share of stone chipping on the nose and one scratch on the side panel, but it remarkably straight with perfect gaps and shut lines and still very presentable. The paint is still deep and shiny! The interior is all original and un-restored with a crack-free dash, perfect door panels and beautiful unstained headliner. Seats are undamaged but a little soft. Good original carpets. This collectable Porsche comes with full documentation, manual and service books, jack and complete tool kit. Early swb 911s are hot with collectors. An un-restored, original paint example with complete documentation is considered a blue chip investement.